A fluidized bed dryer, or fluid bed dryer, is a type of equipment used in many commercial processing applications including food, pharmaceutical and nutraceutical processing. Fluid bed dryer bags are used to capture and retain product during processing. The filtration requirements of a fluid bed dryer bag can vary with each application. Particle capture and product retention, often at sub-micron levels, are critical in developing reliable R&D assays, as well as preventing loss of expensive products during routine production runs. 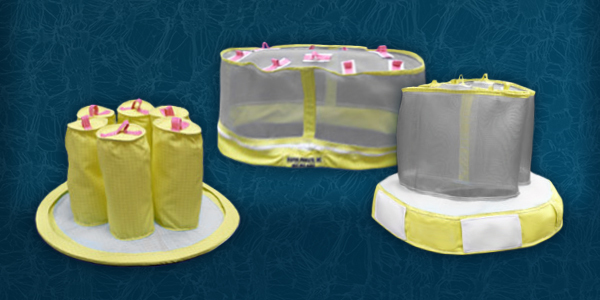 Filter Holdings offers a complete line of standard and custom fluid bed dryer bags. Expertly crafted from quality filter fabrics, our fluid bed dryer bags can be fabricated in all shapes and sizes for any industry requiring fluid bed dryer filtration. Customers can choose from a variety of non-conductive fabrics and static conductive fabrics including high-flow screen cloths with a retention rate of 1000 micron or more, to fabrics with retention rates at sub-micron levels. Filter media treated with our Unipore expanded PTFE surface treatment offers excellent particle retention and can capture particles down to 0.25 microns - with no impact to throughput. Our Unipore treatment also results in a slick hydrophobic surface which releases dust quickly and efficiently, and prevents chemical attack. After your first order is produced, we digitally store your fluid bed dryer bag specifications. These patterns and features will guide our laser cutting equipment to produce identical fluid bed dryer bags on each re-order, ensuring a consistent fit. Premium filter bags and industrial filtration products for air, gas and liquid filtration. Our Industrial Filtration Experts blend the benefits of modern digital equipment with old world craftsmanship to produce filter bags and other filtration products of the highest quality, with custom precision unsurpassed in the industry. ©2018-2019 Filter Holdings, Inc. All Rights Reserved.